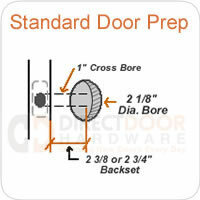 Replacing or ordering new door hardware can sometimes be a little complicated. For most of our homes it's actually pretty simple if we just know a few basics about door hardware, how it's installed and the different applications. To help you out, we've created Door Hardware 101. This section of our website is organized into two categories, Residential Door Hardware and Commercial Door Hardware. Just click on an article from each section to learn more.